You are here: Home / Startups / I Dare You To Peek Into ‘The Entrepreneur Mind’! I Dare You To Peek Into ‘The Entrepreneur Mind’! 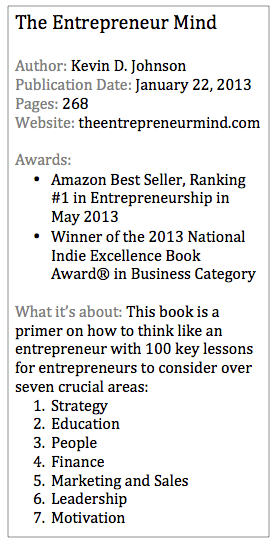 Please see the end of this review for how you can win a free copy of The Entrepreneur Mind. The author of The Entrepreneur Mind is Kevin D. Johnson. At 34 years-old, he is the founder and CEO of Johnson Media Inc. and a serial entrepreneur, with several years of experience leading his multimillion-dollar marketing and communications company that now serves many of the most notable Fortune 100 businesses. What makes this book such a great read is that Kevin openly shares very relevant and personal details about how he has succeeded and failed in his journey being an entrepreneur from a young age. He is still relatively young at 34, so his stories and lessons will be especially enjoyed by anyone who is young in age and thinking of becoming an entrepreneur. Lesson #7: Ask For Help – Kevin advises that you lose your ego immediately when you start your business. Confidence attracts people but ego repels them. Kevin explains that the quickest way to live a life of mediocre accomplishments is to believe you can tackle a major task all by yourself. Lesson #13: Fire Your Worst Customers – When you first start your business you don’t need to take every customer you can get. Kevin tells of some of the losses he’s suffered from some clients that he knew he should have dropped. Some of his tips: be skeptical of clients who constantly make changes; be careful of clients who don’t pay an hourly/piece rate; listen to your instinct about each client. Lesson #17: A Bad Economy Is A Great Opportunity – This is extremely relevant today. Dig in while the recession is here and prepare for the eventual upturn—you will be positioned well to capture the tremendous value that will be generated soon enough. Hard work now will ensure you’re first in line once the next growth period hits. Lesson #24: Nonprofit Really Means Profit – This was an eye-opener about how providing products/services to non-profits can be lucrative. Why? In Kevin’s words: Nonprofits do spend money; nonprofits are willing to take risks with new vendors to save money or reduce costs; nonprofits can be loyal and will refer you to other nonprofits if you are excellent. Lesson #30: Find An Enemy – This lesson comes with a great story about how Kevin made sure to find an enemy as soon as he started his Atlanta magazine. Him and his team aspired to crush their closest competitor. This mindset gave Kevin’s team the motivation to always produce content for their magazine that exceeded that of their competitor. Lesson #47: Don’t Manage People, Manage Expectations – Kevin shares how his introverted personality and preference for dealing with computers rather than people created problems for him in managing people. After telling some of his stories of failing to manage people in his publishing software company, Kevin gives us great advice in that we should not manage people, but should clearly define and manage our expectations of them. Lesson #76: Don’t Hold Grudges – This one is very hard for me, so I think that’s why I enjoyed Kevin’s lesson on it. He tells us how becoming personally hurt by others can negatively affect our business. He was able to not hold a grudge against a Fortune 100 company that rejected his business early on, but because Kevin did not hold a grudge the Fortune 100 firm finally became a client. Lesson #90: It’s Not About Being Your Own Boss – Kevin sheds new light on this claim by many that one of the greatest benefits of entrepreneurship is you get to be your own boss. Kevin says this is lame. Kevin reminds us that those who want to be free to do what they want when they want typically make horrible entrepreneurs. If you want success as an entrepreneur, we’re reminded that discipline is a must. Lesson #96: You Feel Unequaled Joy When Your Idea Becomes Reality – To end on a positive note, Kevin shares his stories of watching and hearing back from customers that tried out his new magazine in Atlanta when he first got into publishing. This happened again for him when he became a developer of software products. He reminds us that there is immense joy when your idea is finally transformed into reality and people love it. Kevin’s goals for the book were to add a fresh and practical perspective on how to be an entrepreneur, as well as to help young entrepreneurs avoid the mistakes he made. As for the first goal I believe Kevin has fully delivered. I was highly entertained by all of his stories. He’s started several companies, so the stories are varied and interesting. He also talks about his college years at Morehouse College as a NASA scholar, working for IBM and Arthur Anderson, and now being a mentor to young entrepreneurs. Only time will tell if he’s delivered on his last goal—helping young people avoid his mistakes. I enjoyed how each lesson was very short at just a page or two. I could flip to any lesson I wanted and quickly get his insight if I wanted. Above all, I could relate very well with Kevin because we are close in age at around 34, so his stories and lessons rang true for me in terms of the context of the era in which we grew up being very similar. It’s nice to read books written by entrepreneurs now very old in age, but one wonders how much of their recollection of their early years is correct. When I read The Entrepreneur Mind, I feel as though I’m getting the latest and greatest advice in real-time because Kevin is telling us his stories that took place just a few years ago. Thanks Zach! I took your advice and decided to start using the original review format again. Do you have a question about entrepreneurship for the author? Not at the moment KMan. Thanks for the offer. What is the #1 advice that you would give to those who are thinking of leaving your current 9-to-5 job in favor of starting their first business? João, thank you for your excellent question. I’ll be sure to include this in my questions to Kevin D. Johnson. How can entrepreneurs find and contact mentors to give advice on business decisions?